Our youngest is quite a character. She says the funniest things and her timing and expressions are priceless. 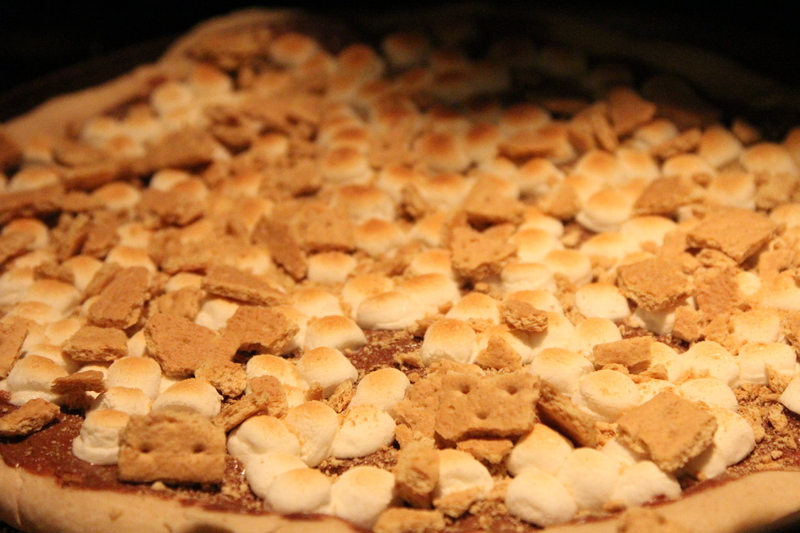 She’s been requesting me to make S’more Pizza so I’ll have to do that this weekend for sure! Yum! I thought I’d repost it for you in case you need a refresher. This week our youngest, Mae asks me to make her bacon and eggs for breakfast and I tell her I don’t have time to make a big breakfast so how about she have oatmeal or a Pop Tart instead (I know, best mom ever, right?!!) 🙂 Well, she responds that “Actually, I’m so over Pop Tarts.” and sees me laugh and agrees to cereal and hot tea. As I was looking over pictures to edit yesterday, she’s in the kitchen and comes in and announces that “The stuff in the broken snowflake cup sure does taste like garlic!” I responded, “Well, Mae that’s a cup full of grease drippings. Did you try to eat it?” She says she just had a little taste with a spoon. Ha. Reminds me of the time one of them opened up a gold foil wrapped chicken bullion cube and stuck it in their mouth thinking it was some special kind of chocolate. Mae keeps me on my toes, that’s for sure! I wish I was diligent and had a little journal so I could write down every funny thing she and her sisters ever say and give it to them when they have their own kids. I remember this family that I babysat for during college did that. Such a special idea. I guess I’m a little late to the party on that one, though. Summer is headed out the door, but you can still enjoy those seasonal treats year round. Most kids like S’mores and sitting around a campfire roasting marshmallows is an important part of childhood. But S’mores are not always convenient and the eye piercing campfire sticks and fingers coated with melted marshmallows (AKA the stickiest substance known to man) are not always on every parent’s list of favorites. 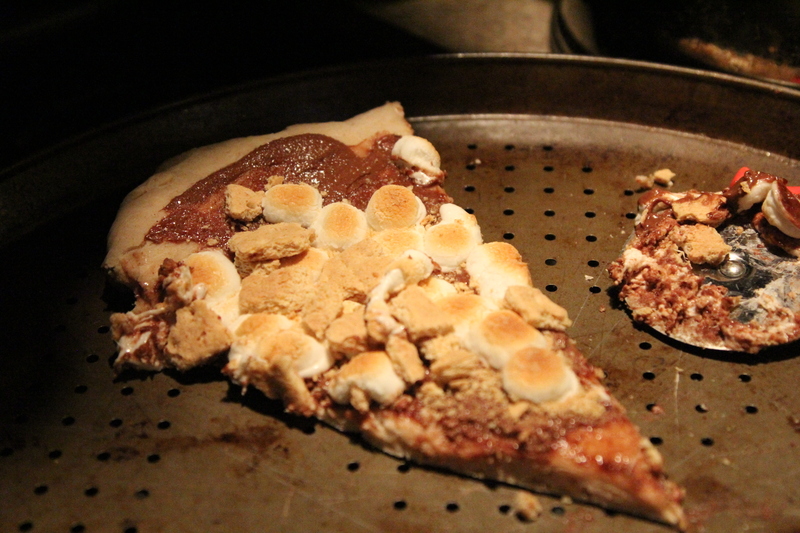 S’more pizza lets you enjoy the classic summer flavors year round or when you don’t want to have a fire, or risk launching flaming marshmallows into the sky trying to get them off your stick. That was a total Dennis the Menace reference, in case you haven’t seen that one. The good one with Walter Mathau and the sweet Joan Plowright. 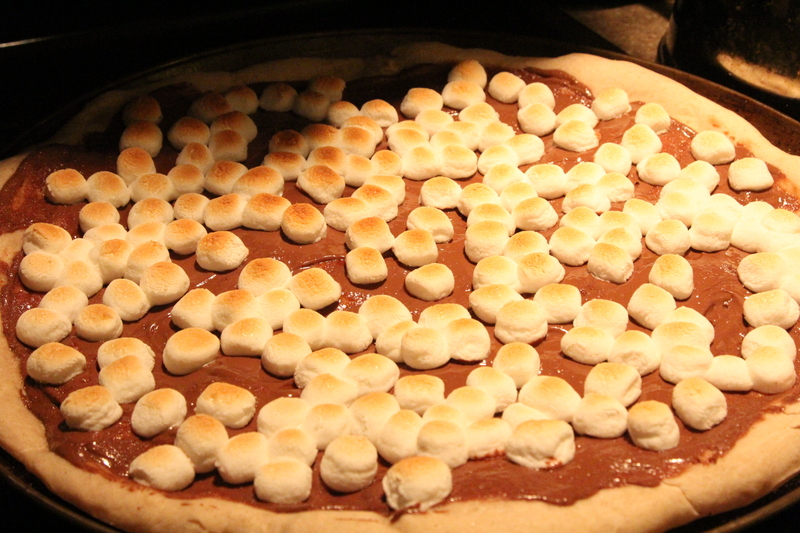 You can make this S’more Pizza in the oven or on the grill. Either way, it is an easy way to bring you back to your childhood – or make some memories with your own kiddos. You can jazz up the toppings to suit your cravings too. My recipe is no way an exact measurement, just giving you the idea and you can go with it however you wish! Go forth and get your S’more on! My recipe includes ingredients and directions to make homemade pizza dough. 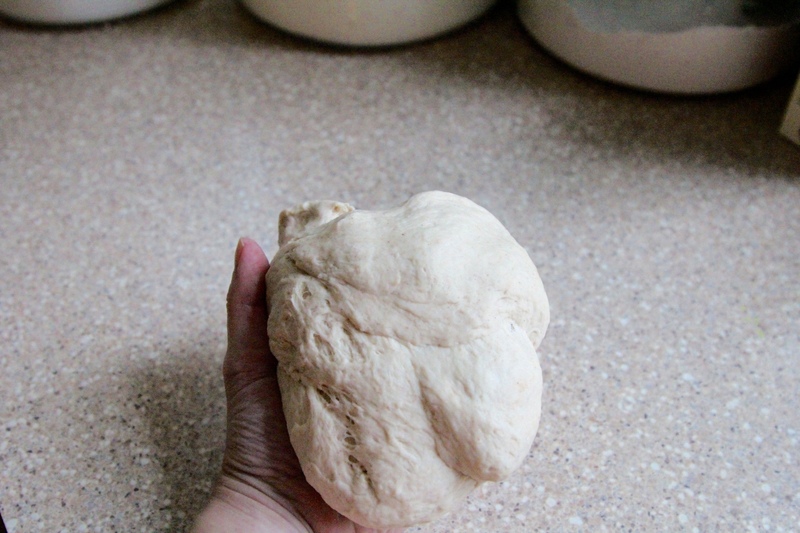 You could also just use store-bought dough, but since it’s so inexpensive and easy to make – I just make my own. You could use Nutella, peanut butter, white chocolate chips, dark chocolate chips, caramel, M&M’s. My husband’s favorite is butterscotch chips so I like to use a combo of chocolate and butterscotch if I have them on hand. Heat oven to 200 degrees F, and then turn the oven off. 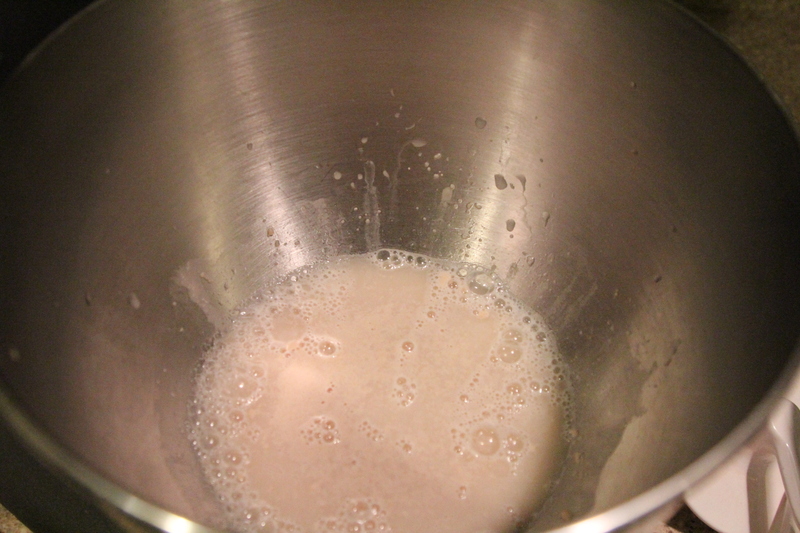 Add yeast, honey, and warm water to a stand mixer and stir to combine. Let this sit for 3-4 minutes until it becomes bubbly and yeast is active. Mix in about half the amount of flour and knead with dough hook and then slowly add in additional cups until it starts to form a dough. Scrape the sides of the bowl and dough hook occasionally with rubber spatula. 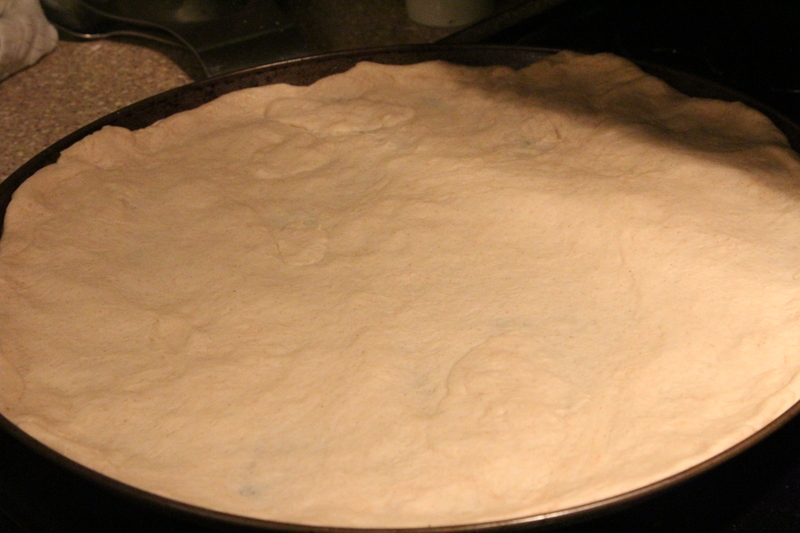 Gradually add in the remaining flour a little at a time until the flour is incorporated. You may need to add in more flour if dough is too sticky, or add in a tiny bit of water and oil if dough seems too crumbly and dry. You want a smooth looking dough. Once the dough seems to be the right consistency, let the dough hook knead the dough for 4-5 minutes, cleaning off the dough hook a couple of times until the dough is smooth and no longer sticky to the touch. You could be able to hold it, stretch it etc with very little sticking to your hands. 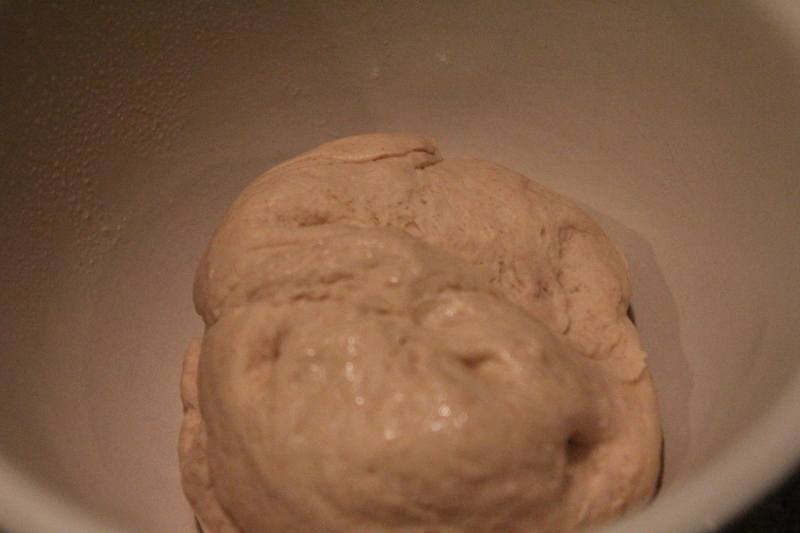 Place the dough in an oiled bowl, cover lightly and place in warm oven for an hour or so until it’s risen. 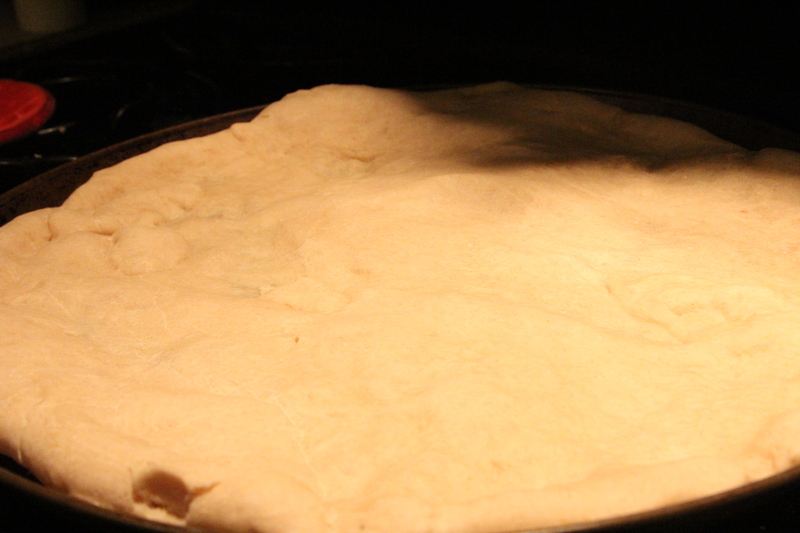 Once it’s risen, form it into a pizza crust on a lightly oiled pizza pan. Bake the bare crust at 425 degrees for around 6-7 minutes or until it’s beginning to get golden brown and the underside is done. Start to add on your toppings. 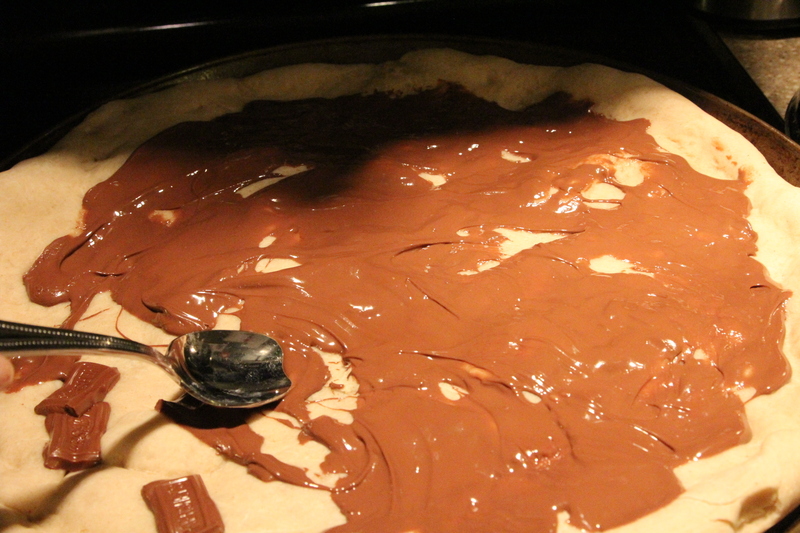 Start with chocolate, Nutella, or peanut butter if using. 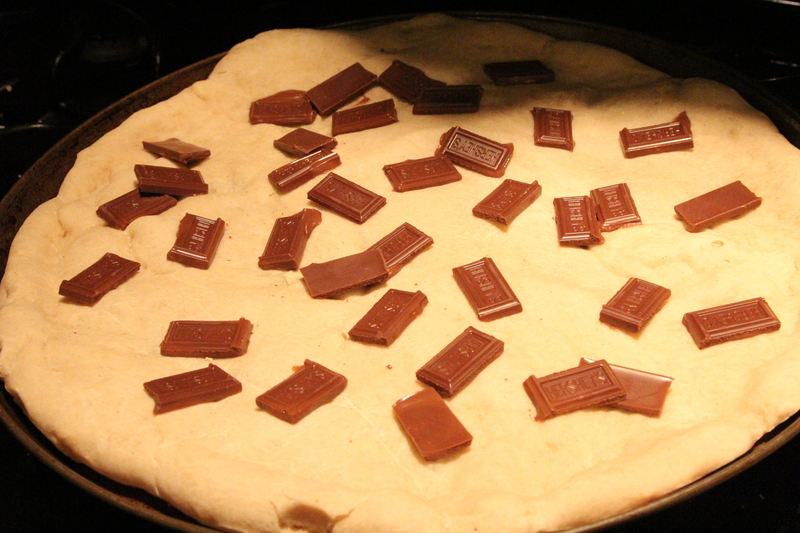 The chocolate will melt easily on the hot crust. Just spread it out with a spoon and then add on the rest of your toppings. 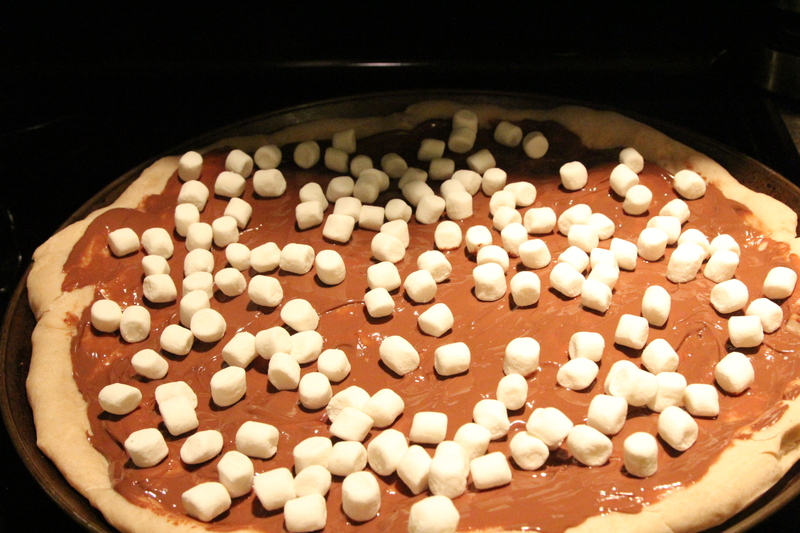 I layer on the mini marshmallows next. Followed by sprinkling cinnamon sugar around the edge of the crust. Change your oven to a high Broil. 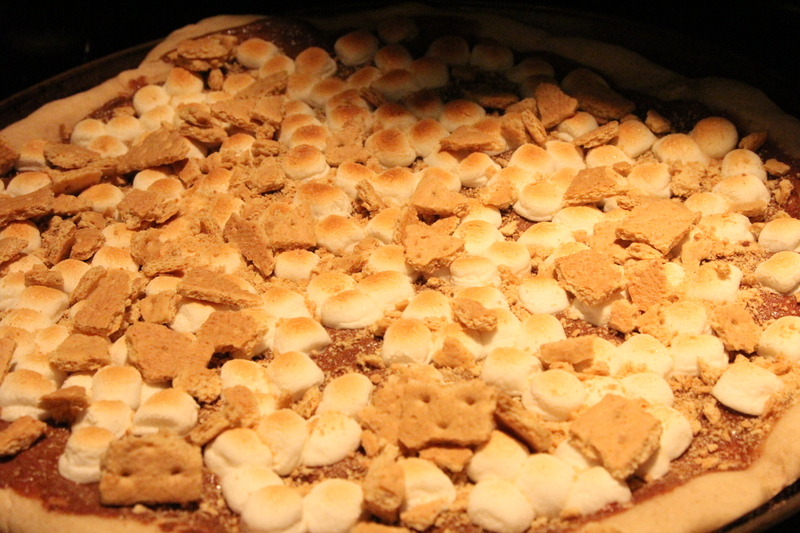 Once you have all your toppings on, broil the pizza for just a minute until those marshmallows are toasted all golden. Watch the pizza like a hawk, you don’t want to burn it! 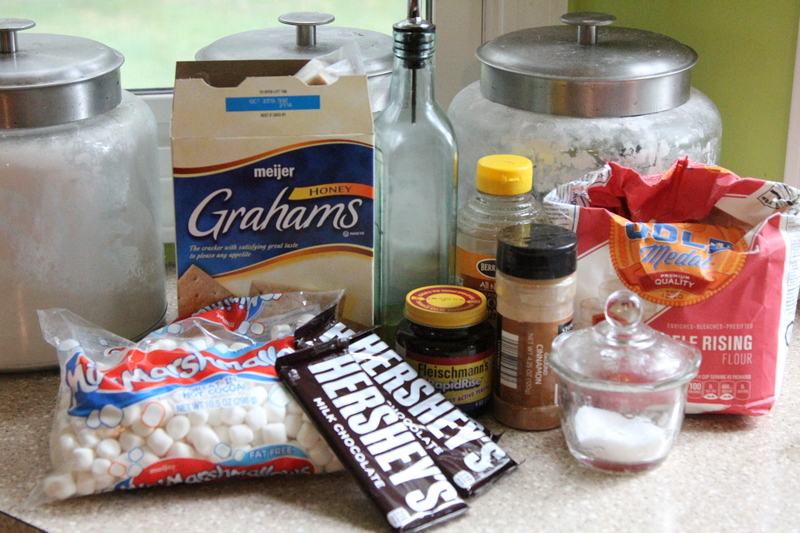 Add on your crushed graham crackers. Slice and serve! It will disappear quick! **UPDATE** I usually make an extra batch of dough and after it’s all kneaded and smooth, I seal it up in Press and Seal, a freezer bag and then put it in the freezer. 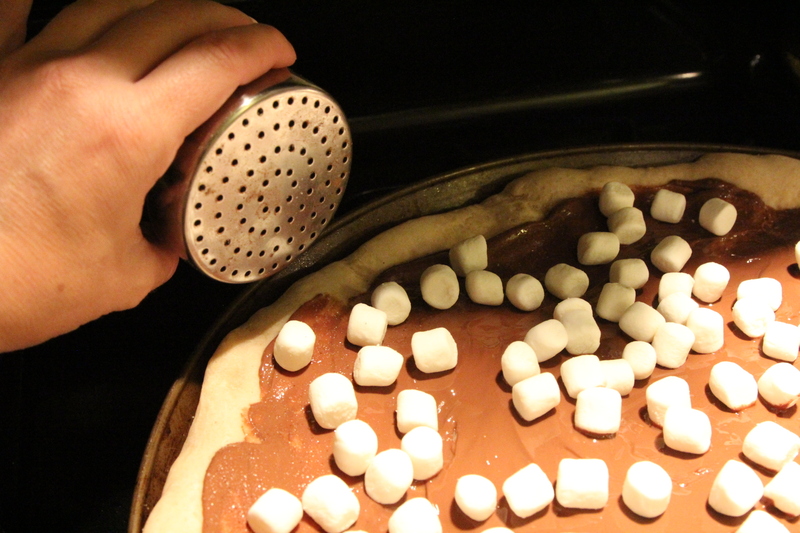 Then when someone requests a S’more Pizza (more likely they pester me until I give in), I thaw the dough out and let it rise and then make the pizza. 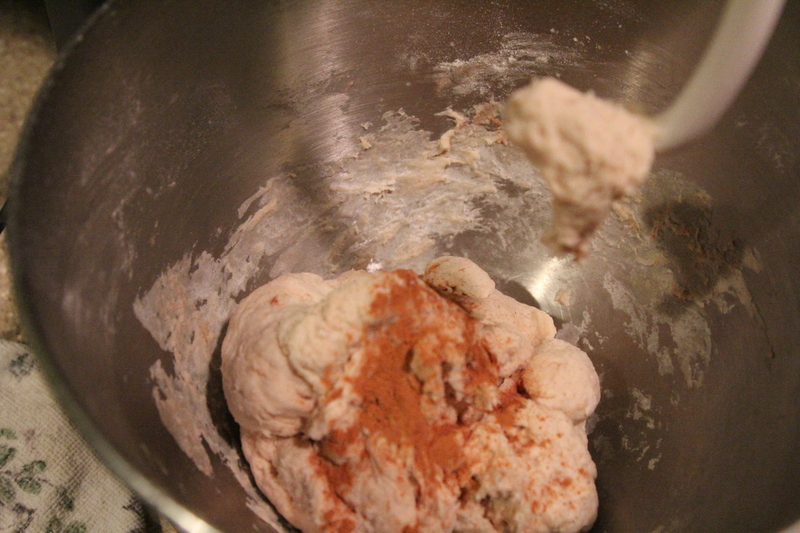 Actually I think the frozen dough in my freezer is just regular pizza dough so I’ll just add some cinnamon to it, give it a little knead and then sprinkle the edge with cinnamon and sugar.